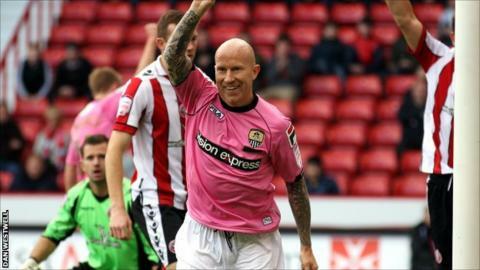 Sheffield United and Notts County played out an entertaining draw in League One. The hosts had the better of a goalless first half, but could not find a way past the inspired Bartosz Bialkowski. But Dave Kitson powered a bullet header into the top corner shortly after the break to put the Blades ahead. Francois Zoko's header was well saved by home keeper Mark Howard, before substitute Lee Hughes lashed an equaliser into the roof of the net. We are frustrated, we thoroughly deserved to win - we took the game to Notts County, they're the in form team coming to our place and we knew it was going to be hard. "We really drove for the result, but in the end we didn't kill off the game and it's come to haunt us." "They (Notts County) had one real chance from some scruffy clearances and it ends up in our net." "We had to try and quieten the crowd and slow down any momentum they had. "We showed great character, great commitment and great belief and we stuck to the game plan. "There is a never-say-die attitude that is growing game by game in the changing room. We don't roll over."